I have a few videos that will show you how to do that. Proprioception is the ability to sense yourself in space. Best exercise is one leg balancing. Start on a hard surface like wood floor or tile. Stand next to something in case you need to grab on. Lift up one leg. Stand on only one foot. Focus on a spot. Remain standing and focused for 1 minute. Set a timer. When this gets too easy, move to uneven ground. Carpet, then put towels on the carpet. Once you get really good, close your eyes. A balance board or bosu ball are the end goal. 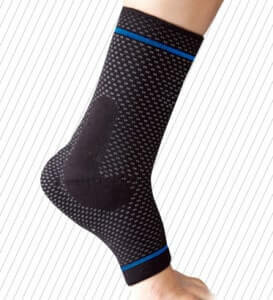 Ankle sleeves will give the ankle more support without the worry of keeping the ankle weak. Ankle braces on the other hand have a tendency to weaken the ankle in the long run and should be used for a short period.